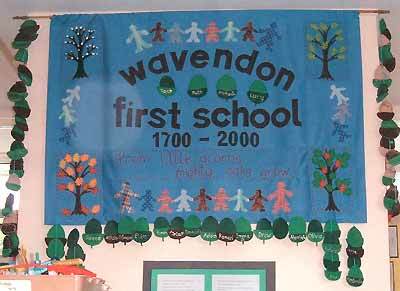 There has been a school in Wavendon since the 1700s when a school was set up by George Wells to educate a small number of apprentice boys. The school moved to its present site in the late 1960's and its layout and setting has remained largely unchanged since then despite significant fluctuations in the number of pupils. The village playing fields and views of the hills form a tranquil backdrop to this small primary school creating a sense of space and freedom which is treasured by current and past staff and pupils alike, unchanged for the last thirty years. 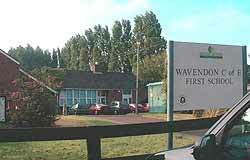 In 1970, all children attending the school came from the catchment area being the parish of Wavendon which also included the Wavendon end of Woburn Sands. 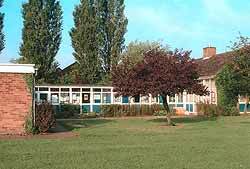 The local children attended the school from age 5 to 11 and then generally went on to Simpson or Leon School in Bletchley. Numbers in school have fluctuated enormously during the last thirty years; from around forty children in 1970 to as low as fifteen in 1976 and regularly twenty to thirty children during the mid to late 1980's. One ex-pupil recalls that there were twelve children in her final year at the age of 11. The age range combined with smaller class sizes meant that it was quite common to mix age groups. Prior to the National Curriculum, teaching was topic based with a focus on practical skills. Teachers came to the school from the follow on schools to be introduced to the leavers and the children also visited their new schools prior to starting the following Autumn term. The school uniform was grey skirts/trousers with silver/black ties and white blouses/shirts. During the late 1970s there was no uniform until the mid 1980s when the present pale blue shirts and navy/grey skirts/ trousers were adopted. The school buildings are largely unchanged from the early seventies. 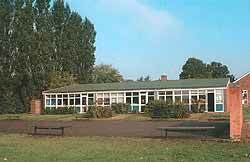 The only exception is an extension to the west side of the school which is currently used by a separate day nursery. The school day started around 8.45am with children who arrived early playing in the playground until they lined up outside to go into school. Children had milk bottles mid-morning around 10/10.15 with lunch at 12. Children enjoyed daily cooked lunches which were prepared in the kitchen, now occupied by the Little Oaks nursery. Food was passed through a serving hatch (which is still in existence) and collected by the meal monitors and taken to the tables in the dining room which is now used as a class room for the oldest children (Year 3). The younger children finished earlier with the oldest children leaving at 3:45. Pupils at the time recall a regimented approach to school life under the strict head teacher Mr Morgan. Children who misbehaved were given lines or detention in the corner and in certain instances the cane. Unlike today school reports were brief and a notice board was placed outside the school with exam results at the end of the year. After Mr Morgan the head teacher was Mrs Norwood until March 1986 when the current head teacher Ms Barker commenced duties. Back to top Go to next page "Involvement in local community"